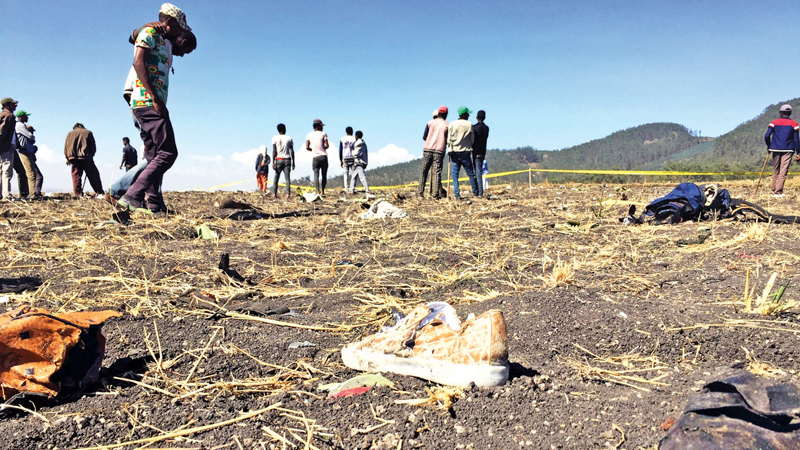 Shoes and other items of passengers who were on the ill-fated Ethiopian Airlines flight. INDONESIA: The head of Indonesia’s national transport safety agency says it will offer to assist the Ethiopian investigation into the crash of a Boeing 737 MAX 8 plane, as Ethiopia and China ground other planes of the same model. The same model of plane, operated by Lion Air, crashed in Indonesia in October, killing all 189 people on board. Like the Ethiopian Airlines crash on Sunday, which killed 157 people, the Lion Air jet had erratic speed in the few minutes it was in the air. Soerjanto Tjahjono, chairman of the National Safety Transportation Board, said Monday that Indonesia can be a party to Ethiopia’s investigation because one of its citizens was among those who died in the crash. The head of Indonesia’s national transport safety agency says it will offer to assist the Ethiopian investigation into the crash of a Boeing 737 MAX 8 plane, as Ethiopia and China ground other planes of the same model. The same model of plane, operated by Lion Air, crashed in Indonesia in October, killing all 189 people on board. Like the Ethiopian Airlines crash on Sunday, which killed 157 people, the Lion Air jet had erratic speed in the few minutes it was in the air. Ethiopian Airlines has grounded its Boeing Co 737 MAX 8 fleet until further notice, the airline said on its Twitter account on Monday, a day after a crash killed all 157 people on board one of its planes of the same type.